« Homepage / Gourmet / "Special Occasion Haven: Chef Augie Lopez gives diners something to smile about"
It is hard to resist the appeal of an opulently apportioned, golden-brown, crisply fried seafood platter at Smilie’s Restaurant, where businessmen gather for power lunches on weekdays, families assemble for dinners that are served with style, and locals congregate to celebrate everything from wedding receptions to baby showers and birthdays in the beautifully appointed, private banquet rooms that are unparalleled in the area. Known for its superb Creole cuisine, friendly staff, and exemplary service, Smilie’s is the place to go when I am craving only the best the city has to offer in the realm of authentic regional cuisine. Since I live nearby in Metairie, Smilie’s has also become the choice spot where I like to take my friends when they are in town. It is ideal for those visitors who are looking for that “real New Orleans” dining experience, but don’t want all the hassle of parking in the French Quarter. The popular fine dining haven in Harahan offers ample parking, and the staff always welcomes patrons like old friends, which is part of the reason why Smilie’s has such a devoted local clientele. Typically, even the best seafood houses fry everything in large batches, and then the chefs assemble their platters from pans of seafood under heat lamps. Not so at Smilie’s, where everything, from the large and luscious soft shell crabs to the plump, salty oysters and ultra-fresh catfish (that tastes as though it just jumped out of the water) is perfectly fried to order in small batches, then presented sizzling hot at your table. The enormous seafood platter ranks right there at the top of the best ones I have ever had in the Greater New Orleans area, which is saying a lot; it comes with extra large, golden-fried shrimp and tender crab cakes that are so tasty and fresh, that they will make you want to get up and kiss the chef. I also like to order Louisiana crab cakes as an entrée. The creamy and crisp, homemade cakes are topped with a scrumptious crawfish Lafitte sauce, and served with potatoes and a fresh vegetable medley. 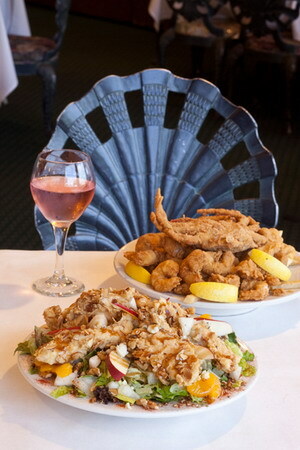 Of course, there is much more to Smilie’s than just their delicious fried seafood platter. Owned by renowned New Orleans restaurateur Augie Lopez, who is an acclaimed, award-winning chef, Smilie’s offers a diverse and very extensive menu with a focus on classic Creole cuisine augmented by Italian flourishes. A native of Puerto Rico, Chef Lopez arrived in New Orleans in 1969, with the ambition to eventually open his own restaurant after having worked at top establishments in other cities. The young chef started out in the best local place possible to “learn the ropes.” He began at world-famous Brennan’s restaurant, where he worked as the second chef under the acclaimed late executive chef Paul Blangé, who created many of Brennan’s signature dishes including bananas Foster and eggs Hussarde (when Blangé was buried, they placed a Brennan’s menu with a knife and fork on his chest; his spirit reportedly still roams the restaurant). 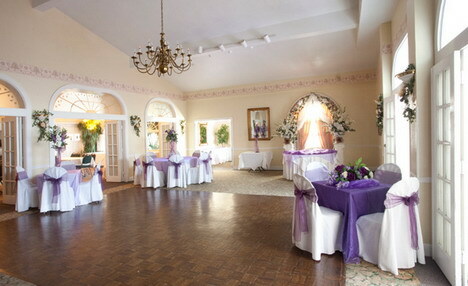 A local landmark, Smilie’s is suitable for all occasions, from intimate and romantic dinners for two to private cocktail parties, large family reunions, and rehearsal dinners. 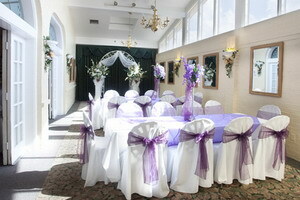 It has long served as a magnet for those who want to experience only the best cuisine and ambience for their wedding reception, but at reasonable prices. “It is very popular with the locals for weddings, birthdays, and private parties,” says Chef Lopez, who purchased the restaurant in 2001. I fondly recall enjoying many wonderful meals at the Windjammer near the shores of Lake Pontchartrain on breezy spring days after going boating at Southern Yacht Club, and those special occasion dinner dates at Augie’s on Veterans Memorial Boulevard. Chef Lopez has enjoyed a loyal, local foodie following that goes back many years. For dinner at Smilie’s, try appetizers such as the delicious seafood gumbo, stuffed mushrooms, and crispy eggplant Lafitte; and if you like salads, this is the place to go! My favorites include the beef brisket salad with crumbled blue cheese and a house-made vinaigrette; the South Pacific walnut salad with fresh spinach, feta, and mandarin oranges in a Vidalia onion dressing, topped with a grilled chicken breast; the Sicilian salad designed with sautéed shrimp and fresh crabmeat, garnished with black olive salad; and the Caribbean salad (a house specialty) made with almond-crusted chicken breast and blue cheese crumbles, tossed in a pepper jelly dressing, and topped with fresh fruit and nuts. There are several delicious Italian dishes worth sampling, including veal Parmesan, a seafood pasta bowl (penne tossed with fresh shrimp, crawfish, and crabmeat in a creamy sauce), and blackened chicken Alfredo. If you like lasagna, don’t miss Smilie’s version; it is a house specialty. The steaks are tender and succulent, and seafood specialties abound. Two of my current favorites are catfish pecan and the broiled redfish in a lemon-butter sauce. “Our best seller is the stuffed eggplant Courtenay,” says Chef Lopez. “The trout Orleans is also highly popular.” Fresh fish is fried to a golden brown, topped with fresh jumbo lump crabmeat, and glossed with a light Chardonnay sauce flecked with fresh shallots. For a sweet ending, a must-try is the mouthwatering bread pudding with rum sauce that will make you long for seconds. This is a great spot to take your special valentine and enjoy the rich and romantic chocolate lovers cake. There is a great children’s menu the small fry will enjoy as well. Smilie’s is open for lunch and dinner and for Sunday brunch (you get free champagne with an entrée). For restaurant hours, reservations, and to view the variety of menus for wedding receptions, bridal and baby showers, seminars, banquets, and other special events. Here you can write a comment to the post "Special Occasion Haven: Chef Augie Lopez gives diners something to smile about"